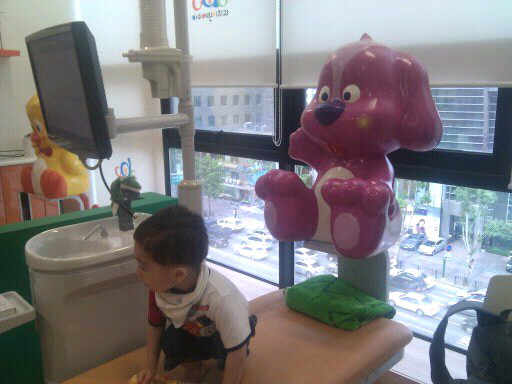 I took J for his first dental check-up when he hit 18 months. The government had sent us a free check-up voucher but all of the available dentist offices were not for children and when I tried to take J to one of them they refused to check him because he's so young (I don't blame them). So I decided to find a children's dentist near our house and I was impressed both with the design and atmosphere of the clinic and also the price for a check-up - 2,000 W (2$US). 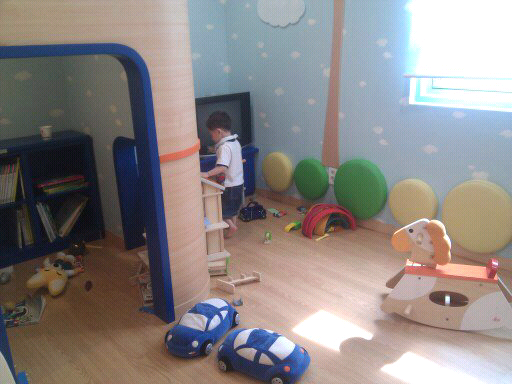 The clinic is huge and has all sorts of rooms for kids to play in. Here J is playing in the toy/computer room. There are fish aquariums, trains, toys, kid's painting, ect. all over the place. Super kid-friendly. 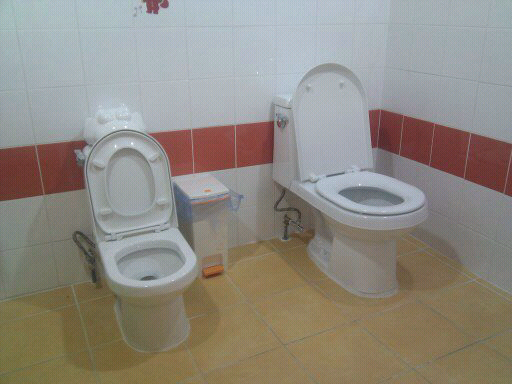 The clinic even has a kid's toilet. How cute is that? Here J is preparing to battle the dentist and nurse. As soon as they touched him he screamed and cried but they were quick and efficient. 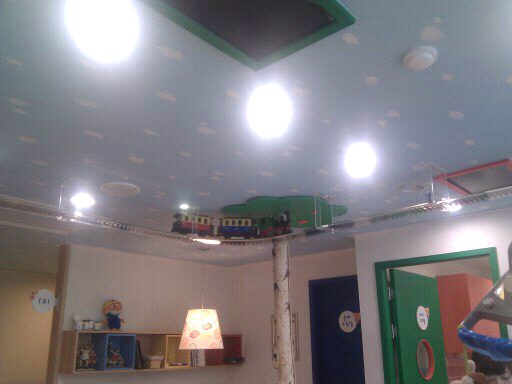 While the children get their teeth checked, this train goes round and round. I've heard that other kid's dentist clinics play Pororo movies. According to the dentist, a child should go for his or her first check up at 1 year, then come back every 3 months. At 2 years of age, fluoride is introduced. We haven't reached that point yet but I will blog about it when we do. Isu Children's Dentist Clinic 6th Floor 02-598-5275 (move your cursuor to the left, you will see Holly's Coffee, then look above it to the 6th floor). Labels: children's dentists Seoul, Isu children's dentist clinic, kid's dentists Dongjak-gu, kid's dentists Gwanak-gu, kid's dentists in Seoul, kid's dentists Isu Station, kid's dentists Sadang St. Thank you for this post.Getting your child into a good oral health routine at a young age will ensure they continue to have good oral health when they are older. while searching for a pediatric dentist.